Bangladesh is well known to the world as a deltaic country crisscrossed by hundreds of rivers. Several are wide enough to hold some of the largest water flows in the world, gathered from the snowmelt waters of the great Himalayan range and monsoon rains. 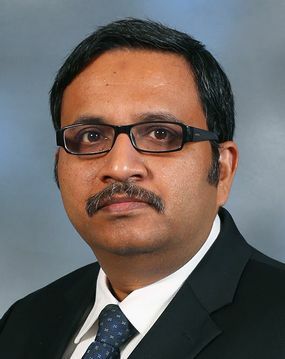 Having enough bridges to achieve an uninterrupted surface communication network in Bangladesh is necessary not only to meet the growing needs of an underdeveloped country, which has been steadily developing over the past decade, but also to meet the emerging demands of joining a regional surface connectivity network. On the ground, it was felt that, first, it was necessary to bridge local stakeholders and global partners to effectively connect bridge professionals with the world knowledge hubs and construction industry. 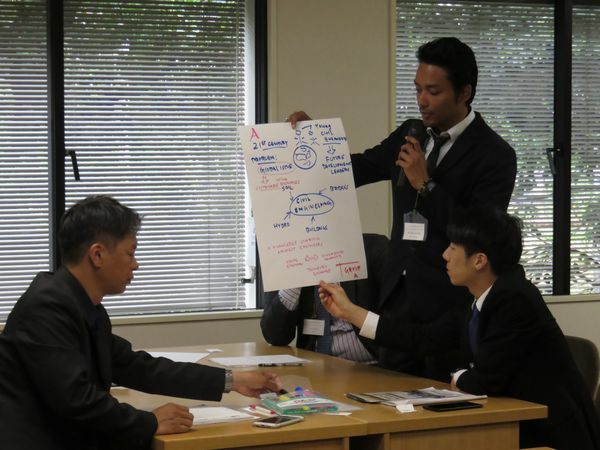 An alumnus from Japan felt this vital need to bridge communities. Signing a Memorandum of Understanding with the Institution of Engineers, Bangladesh was an important event, but the JSCE’s Committee of Steel Structures was the forerunner from Japan that launched JSCE activities on the ground in Bangladesh. It organized the first ever conference on bridge engineering in 2005 in Bangladesh. The effort was well thought in introducing steel as a bridge-building material, which furthered the development of Bangladesh. 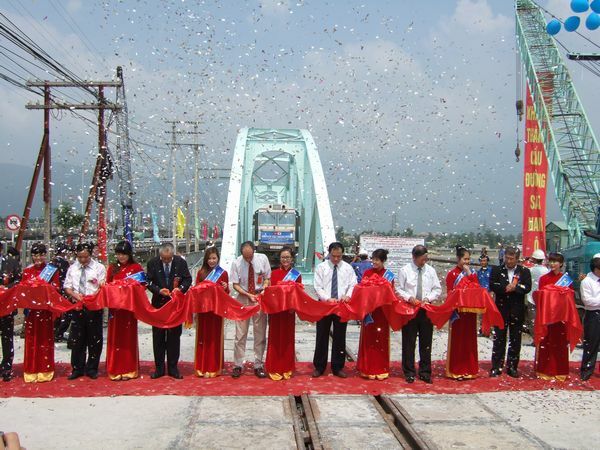 Cooperation was expedited in 2010 and culminated recently in 2015 with the centennial celebration of the Hardinge Bridge (www.iabse-bd.org), a landmark and one of the oldest steel bridges in the region. The fundamental knowledge gained in Japan in translating experimental phenomena into analytical expressions and deriving numerical solutions from boundary value problems to meet a practical need was found to be applicable here, quite metamorphically! The concerted efforts of like minds from Bangladesh, Japan and elsewhere in the world were eventually gathered under the same umbrella. This has allowed for the evolution of steel bridge construction once again on this land over the three mighty rivers of the world—the Padma, the Meghna and the Jamuna—more than a century after the erection of the Hardinge Bridge! Bangladeshi engineers now have opportunities to develop their capacities by working hand in hand with international partners to design and execute some of the most difficult constructions in the world, using deep piling techniques and erecting large-span bridges over the mighty rivers. It is now also necessary to focus on learning state-of-the-art technologies to maintain this large-scale infrastructure to reap the most benefit over its anticipated service life. Application of the best know-how for repairing and rehabilitating the old bridges of Bangladesh is the next issue to address. Furthermore, it is also important for stakeholders to understand material performance under different climates in Bangladesh, the current condition of existing bridges, and practical situations for them accurately to predict the service life of such infrastructures besides, being inspired by bridge mechanics. As of now, Bangladeshi engineers have very little information relating to determining the service life of such infrastructure. Team “Civil Engineering Omotenashi” - Recruiting Now! The Young Civil Engineers Power Up Sub-Committee aims to energize the civil engineering industry through the activities of young people. It’s a committee that gives young people the opportunity to try out their own ideas, whatever they may be. It has a wide range of activities, from sharing technical issues among young people to reforming their working styles. In addition, we hope to spread the activities of Team “Civil Engineering Omotenashi” throughout the country. The activities of the committee and, of course, its members and its events are centered principally around Tokyo. But with civil engineering, there are many times when it can’t be truly experienced without actually going on location. The boom in viewing scenery, and the way in which civil engineering has its roots in the land, embracing its formation and history, provide reasons enough for overseas visitors to come to Japan. Most of all, through our activities as Team “Civil Engineering Omotenashi,” we want to remind all young civil engineers, wherever they may be, about just how great their work can be. Currently, Team “Civil Engineering Omotenashi” has begun its work for the 2018 JSCE Annual Meeting to be held in Hokkaido, the 8th Civil Engineering Conference in the Asian Region (CECAR8) to be held in Tokyo in 2019, along with its technical tour for young people, with Niigata being considered as a possible destination. Then in 2020, we’re looking to plan our projects for the Olympic and Paralympic Games. We’d be glad to have you as a member of Team “Civil Engineering Omotenashi.” We look forward to you joining us. 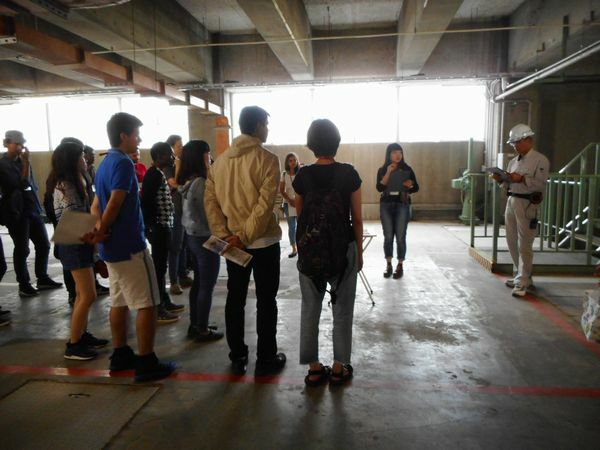 Site visit for Hokkaido Technical Tour for students organized by students at Hokkaido Univ. General Manager, Laboratory for Construction, MATLAB CO., LTD. Living and studying in Japan for 8 months has helped me to achieve many to develop myself in numerous ways – the first and most important thing being the experiences in academics and laboratory facilities. Hokkaido University is one of the top ranked universities in the world not only in the fields of technology and engineering, but also in the education and research standards, as in the most of the Japanese higher educational institutions with the best of guidance around which are at the world-class level. In Cambodia, we have the image of Japan as an island country which has come to acquire a world superpower status because of hard-working people, their uncompromising pursuit of high-standard practice and technological development. Besides studying and doing researches, I have had the good fortunes of meeting the Japanese families who invited foreign students like me to festivals and gatherings organized by them that helped them to gain first-hand experience of the Japanese culture. 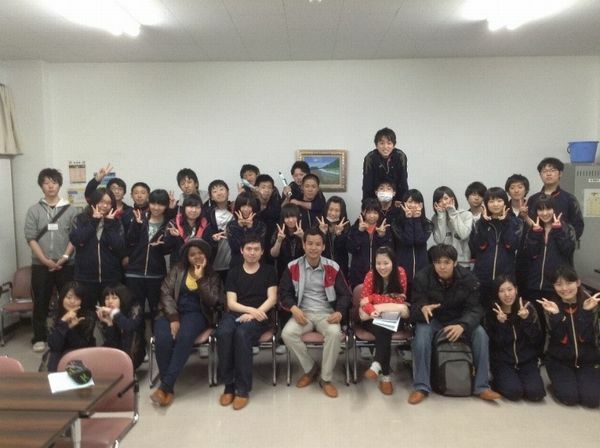 During my stay and studies in Japan, I could devote some of my time to volunteer and extra-curricular activities. I have involved in an event called “Global Village 2014” organized by Japanese young students. 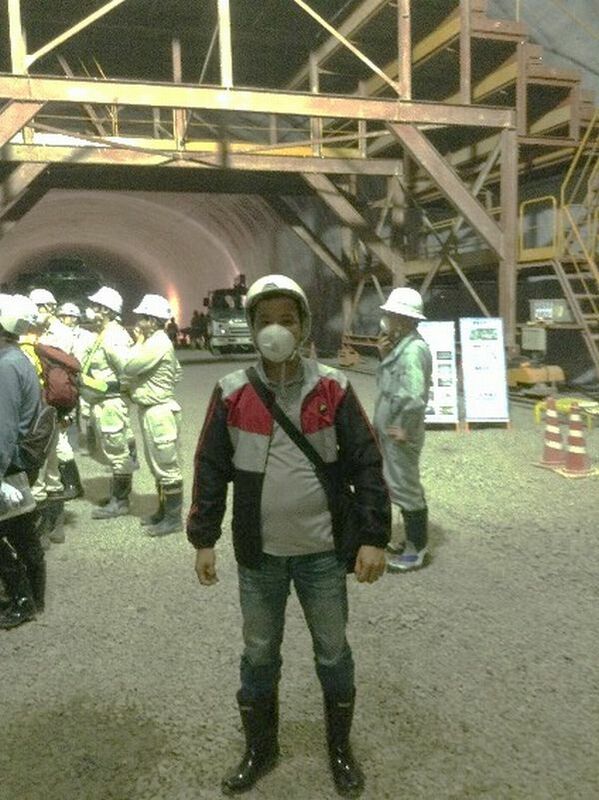 In the geotechnical laboratory in Hokkaido University, I was lucky to meet outstanding academic staff and research students who had very unique characters and avidly pursued new knowledge and I enjoyed living studying, and researching there. Also, my adviser was very kind to support me not only academically, but also personally: he offered valuable advice and helped personal matters. During my time in Hokkaido University, besides conducting an experiment on confined swelling test of expansive clay, I had special lectures and hot discussions in various meetings and seminars relating to constitutive model research, effective stress principle and total stress method, and stress strain behaviors of soil all of which were fundamental researches useful for practicing geotechnical engineering. As a result of those experiences, I could understand the reasons why civil engineering, especially geotechnical field in Japan was highly advanced. After completing my doctoral degree sandwich program in 2015, I became a lecturer and researcher at Institute of Technology of Cambodia (ITC). One thing I came up in my mind during the time I spent studying and researching in Japan is that technology should develop in the way of communications and collaboration beyond regions and countries. Recently, Cambodia and Japan have developed a lot of communications and collaborations between them, e.g. The 10th AUN/SEED-Net Regional Conference on Geological and Geo-Resources Engineering (2nd–3rd August, 2017), The 2nd International Symposium on Conservation and Management of Tropical Lakes (24th–26th August, 2017), and many other symposiums and workshops which were joined by Japanese universities and private sectors. Recently, there have been many slope failures along Mekong river banks that is major concern and is a hot topic in Cambodia because every year people living along the Mekong Riverbank lose their lives and properties such as lands and homes. Hence, it is a very interesting topic for me to find out the main causes of the failures and solutions for them. 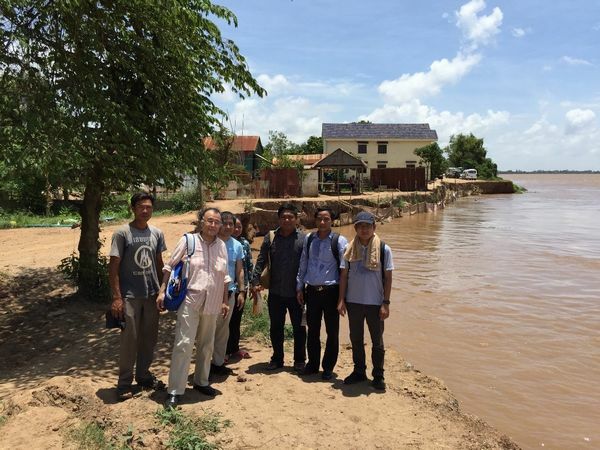 On 3rd August 2017, I went to the Lerkdek district in Kandal province, Cambodia to conduct a site investigation of a riverbank failure with some lecturers from ITC including 3 Japanese engineers from Nippon Koei Co., Ltd. I hope that problem, in cooperation with Japanese institutions, will be successfully solved in the future soon. 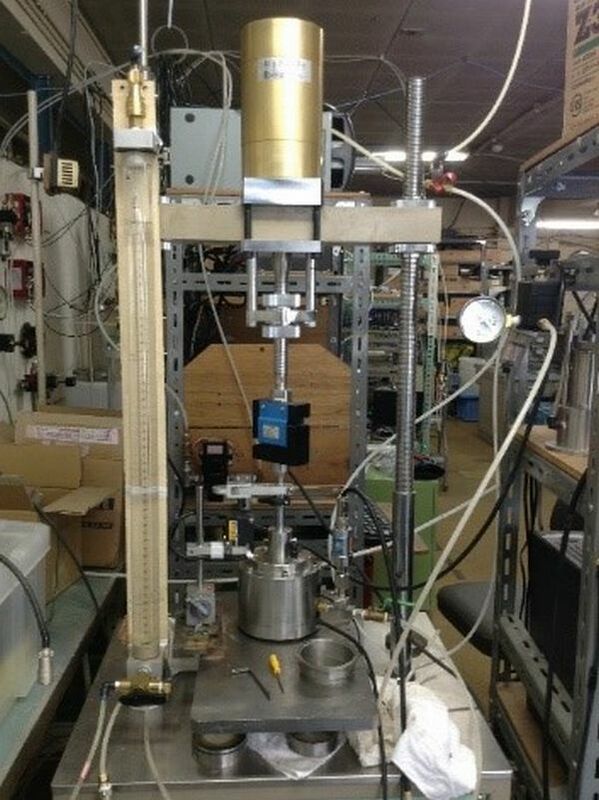 Besides working as academic staff, in March 2017, I became a general manager of a laboratory of the construction company MATLAB CO., LTD, which provides all kinds of testing materials including geotechnical investigations for the development of infrastructures, e.g. airport, houses and buildings, roads, bridges, dams, irrigation systems, following international standards and Cambodian culture. Finally, I would like to take this opportunity to give my sincere thanks particularly to both of my advisors during my doctoral degree Sandwich Program, Professor Suched Likitlersuang from Chulalongkorn University and Associate Professor Satoshi Nishimura from Hokkaido University. Without them, I could not have attained those achievements. I also want to thank all the people I met during my study and work in Thailand as well as Japan who were very helpful and supportive without reservation. Profile: Born in Cambodia in 1988. 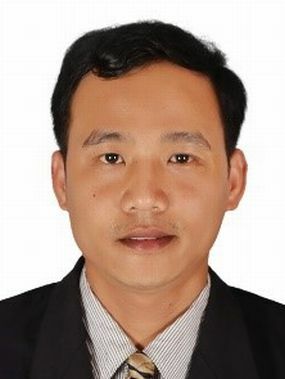 He got a bachelor’s degree in Geotechnical Engineering at Institute of Technology of Cambodia, and a master’s degree at Gadjah Mada University (Indonesia). 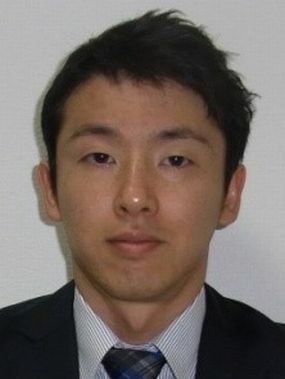 During his doctoral study at Chulalongkorn University (Thailand) from 2012 to 2015, he studied at Hokkaido University on AUN/SEED-Net Doctoral Sandwich Program. 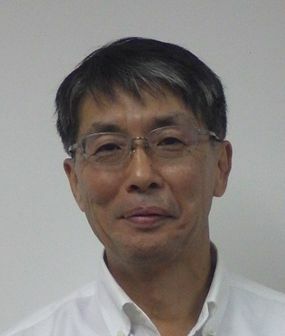 Dr. POR Sopheap visited my research group at Graduate School of Engineering of Hokkaido University twice, for 8 months in total. His task in Japan was to conduct laboratory experiments on expansive soils, which are notoriously problematic in arid regions. It must have been the first time for him to devise/plan/implement/interpret a series of non-routine geotechnical tests, and it surely was a challenging period for him, given the totally different environment he was in. He demonstrated exceptional perseverance in seeing the tasks through – even after going back to Thailand (Chulalongkorn University, where he was based), we exchanged a draft more than 10 times before putting it published in indexed journals. His career is a clear proof of what exposure to a challenging and diverse environment, particularly in overseas countries, in one’s youth will bring to his/her life. General Manager of Hanoi Representative Office, International Division, Tekken Corp.
HANOI - HO CHI MINH CITY RAILWAY LINE BRIDGES SAFETY IMPROVEMENT PROJECT, which was a loan cooperation project from the Government of Japan, included reconstruction work on 44 bridges with serious issues of aging located along the North–South Railway connecting Hanoi and Ho Chi Minh, the accompanying track improvements and the elimination of level crossings, all performed with the aim of achieving safe operation, reduced travel times and increased transportation volumes. 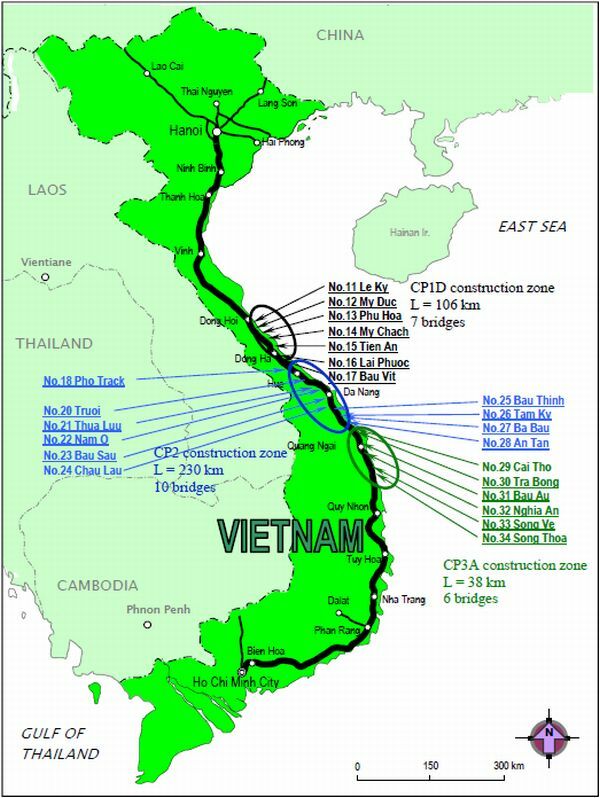 The Hanoi - Ho Chi Minh Line is a total length of L = 1,730 km, with a single track, no electrification, a track gauge of 1,000 mm, and it takes around 29 hours to the entire line by even the fastest train. The construction of the 44 bridges was to be implemented across nine construction zones, and Tekken Corp. conducted the construction of 23 bridges across the three construction zones CP1D, CP2 and CP3A. Here we report the construction undertaken over six years, from May 2010 to May 2016. Bridge replacements were planned at the same locations in which were the bridges on the existing line. 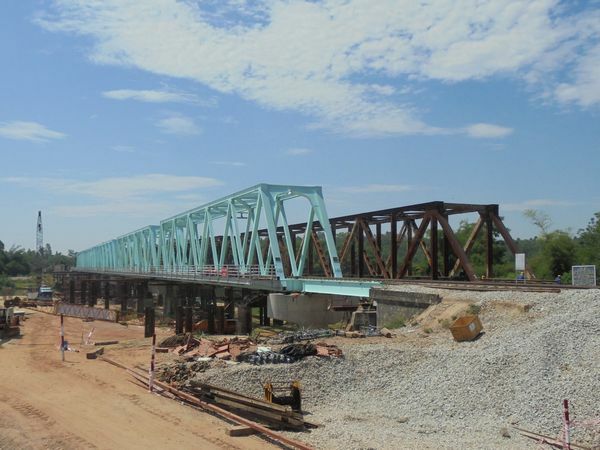 The bridge replacements were carried out using the lateral transfer method except the one for the Nam O Bridge in the CP2 construction zone, where a temporary line construction method was used. Firstly, while keeping regular train operation, new bridge abutments and piers were constructed in the positions not disrupting with the existing structure. Then, a parallel jetty was installed alongside the existing line, and a new bridge was assembled. After its completion, in a 4-5 hour time interval between trains, the existing bridge was removed to the side, and the new bridge was installed by being slid into place laterally. As a new construction methods, we developed collective lateral transfer installation of multiple spans of a bridge. Initially, split construction using temporary girders was planned, but taking into account increasing disruptions to the train services, safety and minimization of train services using temporary girders, all bridge sections were linked and integrated, and the collective lateral transfer installation was adopted. 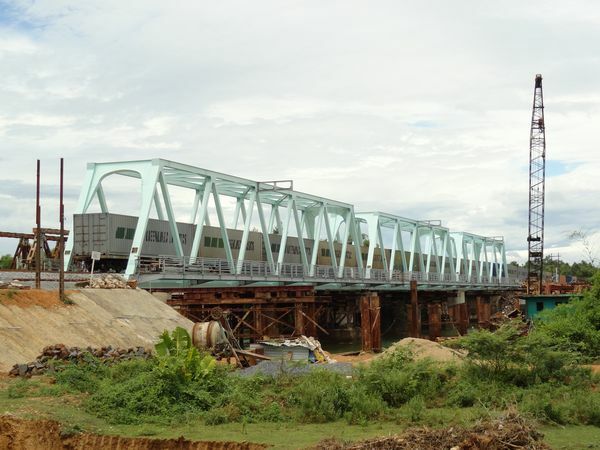 Vietnam’s first five-span collective lateral transfer installation was carried out for the longest bridge in the construction zones - the Tra Bong Bridge (L = 242.2 m = 49.8 m x 4 + 43 m) - located in the CP3A zone, by suspending train services for over five hours train. We collaborated with the employer, consultants and various local authorities, in the three construction zones, and completed the replacements on schedule without accidents and incidents. We believe that the main factor in the success was that, by continuously constructing across the three construction zones, technology transfer was achieved smoothly to the local staff responsible for construction. At the completion ceremony, the company’s construction management methods were highly praised by Mr. Le Manh Hung, Deputy Minister of the Department of Transportation of Vietnam (representing the body responsible for the commission). 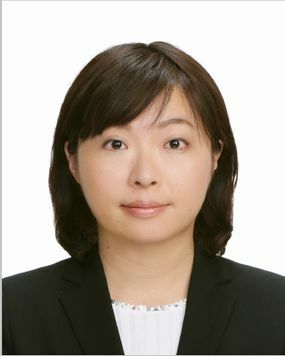 By winning an order of the “Second Central Region Bridge Improvement Plan” (road bridges in four locations) with grant aid from the Japanese Government in November 2012, the company not only conducted the development of not only railways, but also the maintenance of road infrastructure. It is our hope that we contribute to the development of Vietnam by constructing high-quality infrastructure while promoting further technology transfer to the local staff who have been trained through these construction projects. Summary of feature articles in JSCE Magazine Vol. 102, No. 12, December 2017 is available on the JSCE website. Japanese Civil Engineers the Global Leaders Symposium Series No.11 “the Construction of Osman Gazi Bridge in Turkey – a suspension bridge with one of the world’s longest center span” will be held on January 24, 2018.